In 1908, the Indian Head design of Bela Lyon Pratt was placed on the nation’s $2.50 quarter eagles and $5 half eagles. Pratt’s design was unlike any other seen in American coinage, in that the features of the coin were incused (meaning indented or recessed), as opposed to raised above the surface. The obverse depicts a Native American wearing a war bonnet. The reverse is dominated by a vigilant eagle resting watchfully upon a fasces bundle tipped by an arrowhead, held together by an olive branch, symbolizing both military strength and peace. The Indian Head Half Eagle was minted from 1908 through 1916. Production was then suspended until 1929, when 662,000 pieces were struck, most of which were destroyed before ever leaving the Mint. As the Great Depression took hold, economic conditions precluded additional production of the $5 Indian gold coin. The demise of the Indian Head five dollar gold was the last the nation would see of the half eagle in circulation. Since United States gold coins were first minted in 1795, by far the most successful face value denomination in American life was the half eagle. From 1795 to 1916, half eagle production was skipped in only three years: 1801, 1816 and 1817. Through political uncertainty, financial catastrophes and war, the half eagle was indeed a fellow traveler in America’s journey. The $10 Indian Head Eagle gold coin was minted from 1907 to 1933. This coin is considered to be one of the most beautiful gold coins produced by the U.S. Mint. President Theodore Roosevelt commissioned the sculptor Augustus Saint-Gaudens to design the coin. There were 239,406 of these that were put into circulation in the fall of 1907. President Roosevelt strongly felt that using the words In God We Trust was blasphemous so they did not appear on these new coins at first. So there were 33,500 of these coins made in Philadelphia, and another 210,000 in Denver that did not have those words on them in 1907 and 1908. However, Congress was not happy with this decision and insisted that the words be put back on the coins. 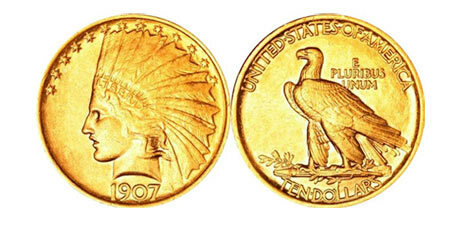 In 1908 they appeared to the left of the eagle on the backside of the $10 Indian Head Gold coin. The mintmarks for Denver (D) and San Francisco (S) appear to the left of the bundle of arrows the eagle is standing on. There is no mintmark for $10 Indian Head Eagles produced in Philadelphia. While there were regular issue coins that were made at all of the mints from 1908 to 1911, and then in 1914, only Philadelphia and San Francisco Mints made eagles in 1912, 1913 and 1915. They were made only in San Francisco in 1916 and 1920.